Hicksville, NY – August 19th, 2013 – The Nassau Suffolk Water Commissioners Association (NSWCA), which consists of commissioners from 21 Nassau County and Suffolk County water district, recently met to discuss pending legislation about Long Island aquifers and our future’s regional water landscape. Dennis Kelleher, President of Melville-based H2M Architects + Engineers, a leading engineering and environmental firm, spoke about several resolutions for creating a regional management commission that were recently introduced in both the Nassau and Suffolk County Legislatures. NSWCA President Gary Brosnan asserted, “As the stewards closest to water production, safety, and environmental and conservation issues, the NSWCA endorses the creation of a Long Island Aquifer Commission. We believe it can be especially effective if the committee includes experienced, qualified representation with first hand knowledge of the drinking water issues that affect nearly three million Long Island residents. Jamie Stanco, Progressive Marketing Group, Inc.
Agency Contact Information: Jamie Stanco, Progressive Marketing Group, Inc. Phone: (631) 756-7160; email: jpstanco@pmgstrategic.com. Indoor & Outdoor Fun, the Scoop on LI Weather, News & More in March 8th's Newsletter! 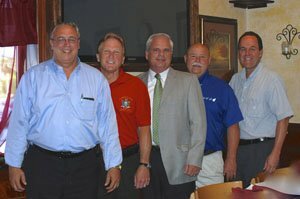 Subject: LongIsland.com - Your Name sent you Article details of "Nassau Suffolk Water Commissioners Association Explores Proposed LI Aquifer Commissioner"